For five local players, BU softball a hometown affair. Jules Forrest/Photo Editor From left to right: Briana Andrews, Meghan Tucker, Jessica Bump, Mikala King and Shannon Kane. All five Binghamton players chose to stay close to home after graduating from local high schools. A photograph of Shannon Kane swinging a bat sits on the windowsill of an office in Binghamton University’s Innovative Technologies Complex. Located front and center, the picture is a valued possession of Terrence Kane, Shannon’s father and the school’s assistant vice president for government relations. The Kanes live in Binghamton, so Shannon’s decision to play softball at BU presented a rare opportunity for the family of an elite college athlete. 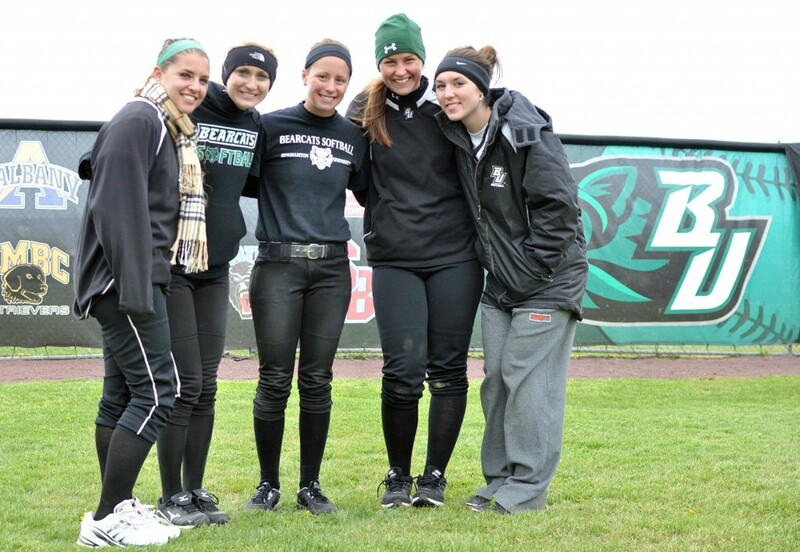 But for Binghamton’s softball team, the Kanes aren’t the only family close enough to do so. Four other Bearcats — Briana Andrews, Meghan Tucker, Mikala King and Jessica Bump — grew up locally, and their families are also regulars at the East Gym Field. In 2008, Briana Andrews, a native of Endicott and graduate of Union Endicott High School, was the only local on Binghamton’s softball team. After a solid high school career, Andrews sought to play for a Division I program, and found a fit right in her backyard. But by choosing BU, Andrews brought local attention to the Bearcats’ softball program and, in turn, started a trend among local players. Meghan Tucker, a Kirkwood native, joined the team a year later. Kane followed, and last year, Mikala King and Jessica Bump, from Binghamton and Windsor, respectively, debuted for the Bearcats. Tucker, who used to attend softball camps run by former BU coach Holly Brown, knew from the beginning that she wanted to play softball at Binghamton. Kane, King and Bump didn’t consider BU from the get-go — each stressed a desire to be independent at college — but all knew that the opportunity to regularly play for their biggest fans was too rare to pass on and ultimately chose to commit. It’s not uncommon for a pair of collegiate teammates to have played against each other in high school, but this team stands as an outlier. King and Kane, both of Chenango Valley High School, became archrivals with Windsor High School’s Bump and Tucker. Andrews also played against them, as Union Endicott played against Chenango Valley and Windsor about once per season. Chenango Valley and Windsor have one of the longest-standing softball rivalries in New York, frequently meeting in the Section 4 regional championship for a spot in the state final. Each duo won one Section 4 championship — both times at the expense of the other. Bump characterized it as a “fun rivalry,” however, because they swapped teammates during summer travel ball. She and King — who played travel basketball together when they were 10 years old — became a summer pair while Tucker and Kane played together. Because of their prominence in high school and their decision to stay local, the players attract residents from the area to home games. Andrews attests to the fact that as more local players joined her, more natives came to support the Bearcats at home. Bump relayed a story her mother told her about local interest in the team. But the fan base isn’t coming from just one demographic. Kane and King coach an Under-12 softball team, and Andrews coaches an Under-18 squad. Their players, along with their high schools’ teams and coaches, also frequently attend games. And their fans’ loyalty doesn’t go unrewarded. The East Gym Field is just as far from Chenango Valley, for example, as Chenango Valley is from the East Gym Field, and the players continue to make their presence felt at their former high schools. “For us to go back and help them out at practice or even just watch one of their games, it’s cool for them to see players that not only stayed local but made it to the Division I level come back and know you were on the same playing field with them,” King said. All five players understand that they serve as role models — proof that local softball players can reach the Division I level — but that fact is evident to parents as well. “When girls in high school see that you can make it playing on Section 4 teams and you can play at a Division I level, it’s encouraging to them, it’s encouraging to their parents,” Kane’s father said. For Terrence Kane, the opportunity to watch and help his daughter throughout her college career has provided him several indelible memories, the most prominent of which occurred in fall 2010. Shannon, a right-handed hitter all her life, thought she would get more playing time if she could become ambidextrous at the plate. Throughout the summer of 2010, he met her in the West Gym batting cages during his lunch breaks, tossing pitches to help Shannon get acclimated to the other side of the batter’s box. If Kane had attended St. John Fisher College in Pittsford, N.Y., her No. 2 option, that moment never would have happened. And that picture of a left-handed-swinging Kane, which serves as a reminder of that summer’s hard work, would have an entirely different meaning.